A layer. Then another layer. The stack effect. A double whammy. A literal celebrity brandwagon. Amitabh Bachchan. Prabhu. Nagarjuna. Manju Warrier. With the cult following that these icons have nationally and regionally in star struck India, one would have imagined that brand Kalyan had enough and more star power to spin many a convincing yarn. But it seems to be a summer of (dis)content. 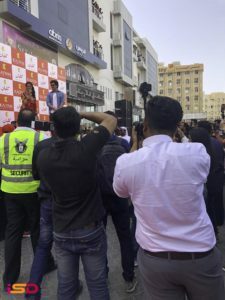 What else explains that such a powerhouse brand like Kalyan would want to add more horse power(and how) by getting King Badshah Khan(SRK) to inaugurate its new showroom in the heart beat of India in Dubai(read Meena Bazaar). 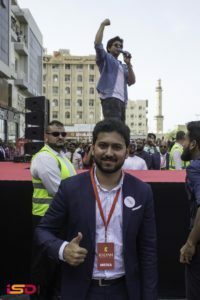 Sizzling mercury and sapping humidity levels of the early Thursday afternoon were no impediments to the fan frenzy on display, that started a good three hours before King Khan came to the scene. That is what brand marketers would define as ‘ pure brand advocacy ‘. ” Till such time I am alive, he will be my God. Nothing oblique but a direct reference to SRK. After my lifetime, I would consider God in any other form, till then it will be him “, avered a lady fan waiting for the heavyweight superstar. FANatic, surely. Just a small indication of the power, the aura, the charisma, the clout of Badshah Khan. Strategically, we believe that this is a tactical master stroke by the Kalyan brand. Cause a major ripple by bringing SRK on board in small rushes, spike up attention and recall and then let the sustaining be done by their existing crop of brand ambassadors. Needless to say wherever there is serious brand power(personal or otherwise), ISD Global(groupisd.com/story) is right in the thick of it. Our band of passionate hustlers and story tellers(#NikhilThekkomkottathil, #SalinduSadishan) were at hand, up close and personal to augment and amplify. The stage was set. And SRK was all the rage. Next Next post: Does the world need another ad agency?